Anchorage Scenes | Real Art Is Better! I try to find places to hang out before they get discovered by everyone else, and become too crowded for my comfort. Mostly because I dislike waiting in line (like a typical Alaskan), and prefer less noisy environments where I can easily communicate with my friends. The Zip Kombucha tap room is one of those places that is still mostly under the radar. I shouldn’t even tell you about it, but at the same time, I want it to prosper. I prefer brewery taprooms over bars, because they offer a comfortable setting without the meat-market/sketchy vibe that most bars have. This taproom is unique in that it offers draft beer in a brewery-taproom setting, but can stay open past 8pm. It can also have live music and games. The craft beer selection is really top-notch. Last week it was the only place in Anchorage that had No Woman No Cryo IPA by Girdwood Brewing on tap. The price is a very reasonable $5 per pint! For those who don’t want to drink alcohol, or are gluten-free, kombucha is on tap in several delightful flavors like blueberry, ginger, or mint. Wine is also on the menu. Delicious and healthy food is available as well. Recently, Glacier Bowl teamed up with Zip to offer poke bowls. Several nights a week there is live entertainment including open-mic night, and music by local musicians. The large space in the brewery even has enough room for dance lessons. The taproom also exhibits art by local artists. In April the featured artist is Scott. His oil paintings and limited-edition prints are on display and available for sale through Zip until May 2nd. This place has it all! What is kombucha? It’s a beverage produced by fermenting sweet tea with a culture of yeast and bacteria. It tastes sweet and sour at the same time, but the flavors are not overwhelming. The yeast eats most of the sugar, so this beverage won’t rot your teeth, and it’s loaded with probiotics. Added flavors like ginger, berries and mint really shine in this clear and fizzy drink. So next time you’re looking for a quiet, yet hip space to meet your friends where you can get food, craft beer, and non-alcoholic, gluten-free beverages, along with entertainment, and art, check out the Zip Kombucha taproom at 3404 Arctic Blvd. The location in midtown is convenient, with plenty of parking. Open every day 4-9pm. Kombucha and draft beer menu. Live music in the Zip Kombucha taproom. Ahi poke bowl by Glacier Bowl. 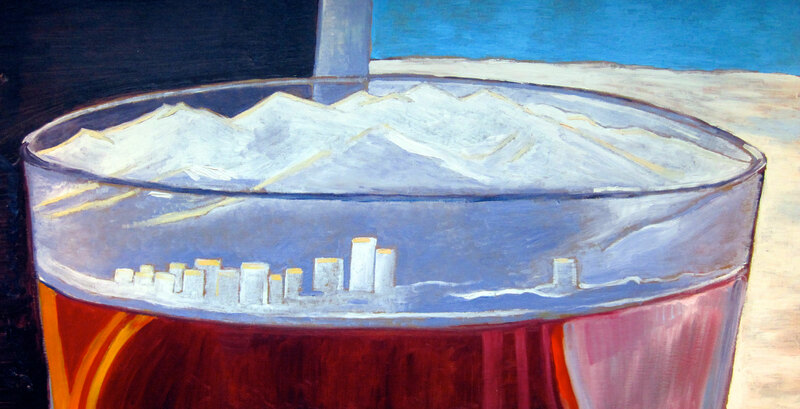 This entry was posted in Anchorage Scenes and tagged Anchorage, anchorage artist, craft beer, live music venue, real art is better, scott clendaniel, what to do in Anchorage, where to eat in Anchorage, Zip kombucha on April 18, 2019 by realartisbetter. Are you Ready to Rondy?! Let’s Rondy! 36″x18″, oil on panel. February 15th 1935, 24 years before Alaska was even a state, Anchorage local Vern Johnson started the first ever Anchorage Fur Rendezvous! Miners and trappers were already in town awakening from the hibernation months of December and January with the hopes of restocking supplies and selling some of their recent harvest. Only three days long, the original Fur Rondy hosted hockey, basketball, skiing, boxing and children’s sled dog races, and not much else. The event has grown over the last 84 years and people have come to expect a grand time during this traditional Alaskan celebration. I remember Rondys of the past — the festival used to last three whole weeks and we got a day off from school just to enjoy the festivities. My mom would bundle us all up in our snow gear and we would trudge off to downtown Anchorage to ride the Ferris wheel, eat elephant ears, and watch super cool events. I remember the party kicking off with the amazing fireworks extravaganza! Some of my favorite classic events as a kid were the Grand Prix Auto Race, World Championship Sled Dog Races, the blanket toss, snowshoe softball, the amazing Rondy Grand Parade, and one not to be missed — the snow sculptures. The festival was shortened from three weeks to ten days in 2008 due to budget constraints. We don’t have the Grand Prix anymore, but we still race sled dogs down 4th Avenue and slam beers at every base during snowshoe softball. Another popular event is the Miners and Trappers Ball, with a beard contest and many costumes made from blue tarps, duct tape and Carhartts. The outhouse races are always a highlight, and of course the new favorite is the Running of the Reindeer. A bunch of Rondy participants dress in costumes and brave running with a pack of horned reindeer. I always wonder if the reindeer are infuriated by the hotdog stands lining the street, selling famous reindeer dogs. Another new tradition is Anchorage Brewing Company’s Rondy Brew. This year it is a delicious NEIPA brewed with 100% Strata hops, which taste like passion fruit! Real Art is Better is strategically located in the 4th Avenue Marketplace, across the street from Rondy Headquarters, in the NW corner of the building. We clean it up and convert it to a small retail space for the weekend. There is also a craft fair inside the building. I invite you to stop in and check out my newest work and take in the view of the Rondy Carnival from our amazing Inlet view window. We’ll be open Saturday and Sunday, 11am – 6pm. I have several new art cards never before released, and many new paintings. I bake cookies for the event and there are great snacks to be found at the craft fair. The studio is a great place to warm up after watching the mushers, or making the trek down the hill to 2nd Avenue to see the snow sculptures. The blanket toss and fur auction are right across the street in the 3rd Avenue parking lot. If you are getting fed up with Alaska style cabin fever, Rondy is the remedy. This is the biggest social event of the winter! Celebrate the end of hibernation season and get ready to PARTY! Dust off those styling furs and show off Anchorage style! Wear your Rondy pin, or risk jail time! This entry was posted in Anchorage Scenes and tagged Alaska Artist, anchorage artist, Anchorage Fur Rondezvous art, Fur Rondy, Fur Rondy Events on February 21, 2019 by realartisbetter. Alaska Baseball League games are great in the land of the midnight sun! We have a wooden bat college league right here of our own. If you show up to an Anchorage Glacier Pilots home game, you can watch the game from the Pilots’ beer garden, which has its very own bar with an impressive selection of craft beer on draft like Fresh Squeezed IPA by Deschutes Brewing, or Sockeye Red IPA by Midnight Sun Brewing! The best part is that a pint is only $6! Where else can you get that kind of price on craft beer at a sporting event? I chose to paint a tall boy PBR can in this painting, because the draft beer is served in a generic plastic cup, and wouldn’t add much to the composition, but PBR is one of the beers you can get at these games. The beer garden is so close to first base, you have to really pay attention, or your beer may be knocked over by a foul ball. So a can is a safer bet. Alaska baseball has been showcasing some serious talent since 1974. Famous players like Mark McGwire, Barry Bonds, Randy Johnson, and a list of many others played here before going pro. All got their start right here way up North. If you are on a trip to Alaska, and you have a few extra hours, I recommend stopping by one of the four ballparks. Every one of them is worth a visit if you are a diehard baseball fan! Cheers to the truly all American game of baseball! What could be better than a bag of peanuts, a cold brew, and hours of cheap, clean entertainment? Thirsty Thursday Beer Painting #146. PBR at Alaska Baseball League game. 8″x10″, oil on panel. This entry was posted in Anchorage Scenes, Thirsty Thursday Series and tagged alaska baseball league, Alaska floatplane, Alaska Painting, anchorage painting, Anchorage pilots, baseball gift, beer artist, chugach mountains, Pabst Blue Ribbon beer art, PBR Art, scott clendaniel on July 12, 2018 by realartisbetter. The other day I was thinking that it would be nice to do a painting to commemorate the area where I live, the Southeast quadrant of Downtown Anchorage, specifically 11th and Eagle Street. I painted the first painting of my pickup truck and building. I was pretty happy because I was able in my painting to fix the damage I had done last summer when I was building the road into my lot in McCarthy, Alaska. It was pretty funny because my wife had some concerns about me working out in the middle of the National Park without any supervision and although she had sent one of her best friends to keep an eye on me I still managed to crash the truck into a tree on the initial run down the driveway. Oops… and even with a reliable spotter telling me okay very good, keep backing up… wait you are going to fast! Oops now you are hitting a TREE! So I fixed the dent in the painting and now we all won’t have to remember the horrible accident and broken mirror for all of eternity. I really do love my truck and we just spent a bunch of money getting that door working smoothly again, although the dent still remains! 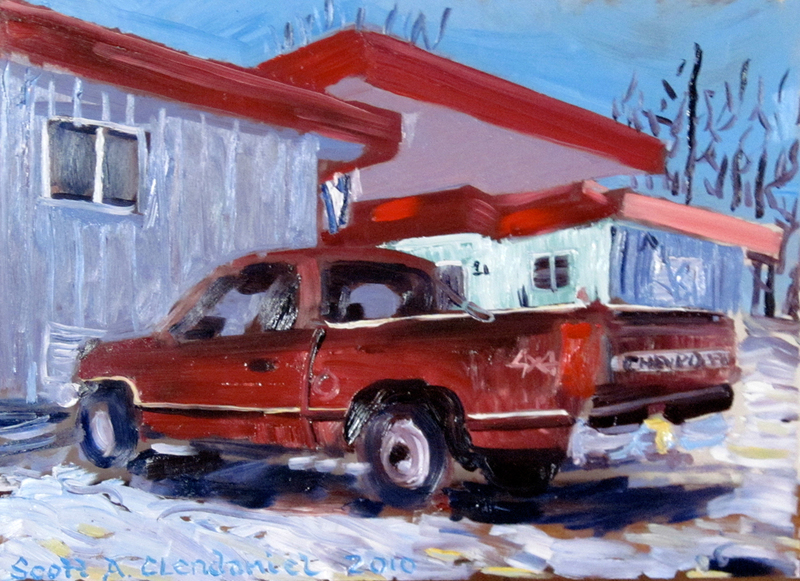 This entry was posted in Anchorage Scenes and tagged Anchorage park, Anchorage winter, Chevy truck painting, plein air painting, scott clendaniel on April 20, 2010 by realartisbetter. I recently went out on assignment as an oil painting teacher for private lessons. 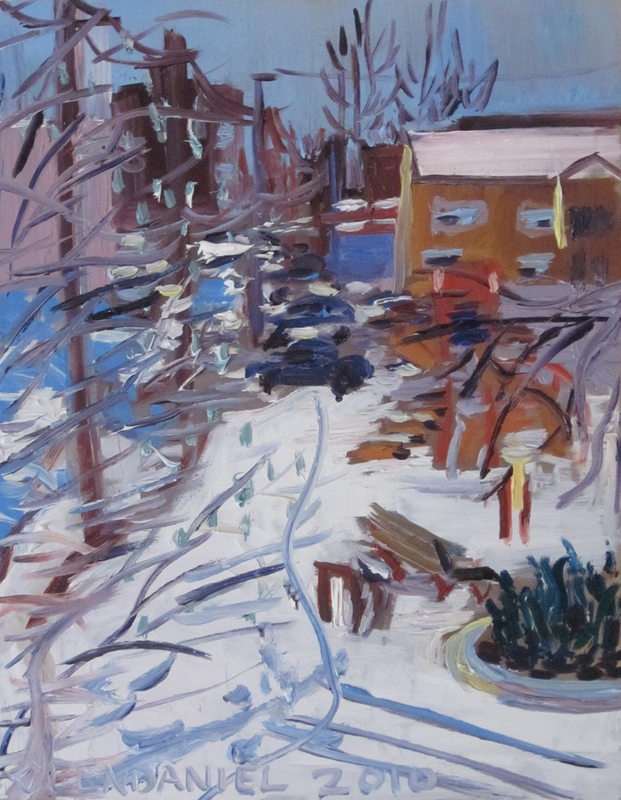 As I was approaching the residence of my group of painters I had the idea that it would be very nice to paint outside. My first thought was to open the garage door, but on further inspection I was led to the backyard which was directly on Jewel Lake. We had the most amazing time getting sloppy with oil paint in the backyard. I dropped this painting off of the dashboard on a driving frenzy to pick-up house paint from my parent’s house. Fortunately the only damage is a little dirt in the sky. 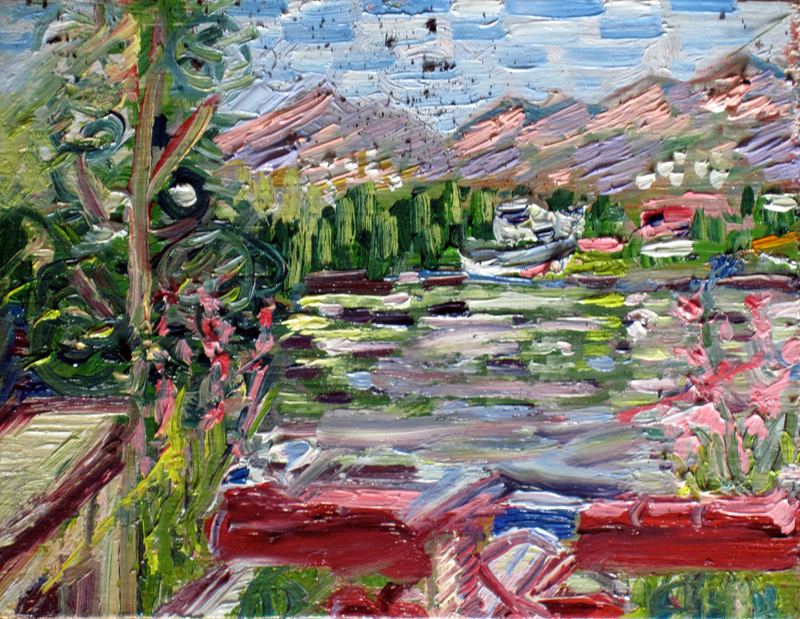 This entry was posted in Anchorage Scenes and tagged Anchorage Alaska painting, Jewel Lake Anchorage painting, oil painting lessons, plein air painting, scott clendaniel on August 12, 2009 by realartisbetter. Hey I am back and I have a new blog page that is finally updated to include all the content from previous versions. I hope this format will work for me. Yesterday I was painting along the Coastal Trail on my way home from a last minute visit with Hanif (parent’s FES) I sent him home with a couple of Clendaniel original paintings, then booked it back home to get some more work done, stopping along the way to paint this scene. I was glad to work as I have a ton of paint that is about to turn from Wrangell St. Elias, and it was nice to see it put to good use! Stay tuned to see tomorrow’s plein air piece from last week in Wrangell St. Elias. 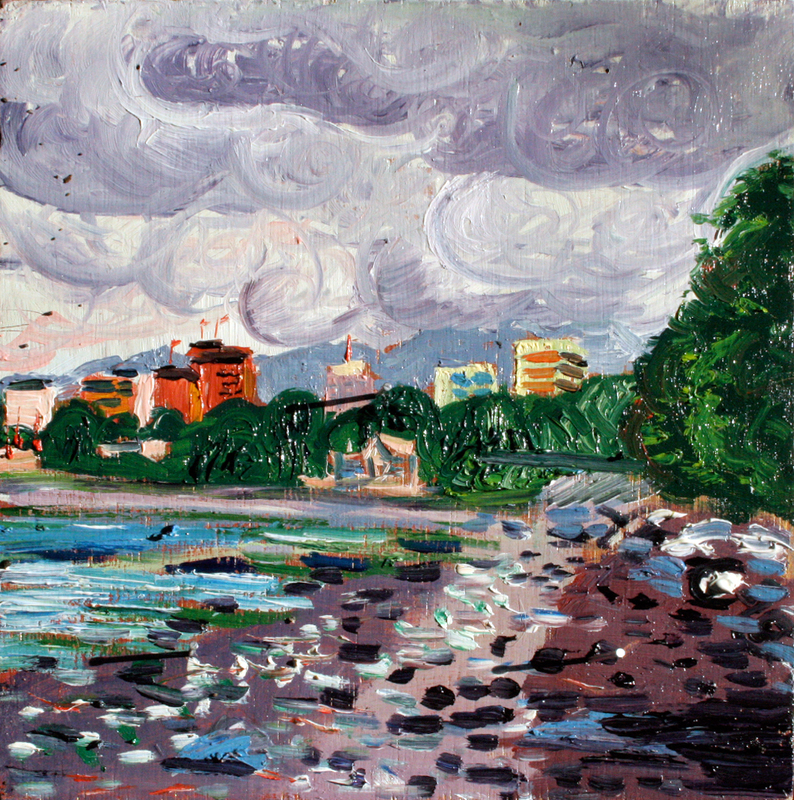 This entry was posted in Anchorage Scenes and tagged anchorage skyline painting, coastal trail anchorage painting, plein air painting, scott clendaniel on June 30, 2009 by realartisbetter.